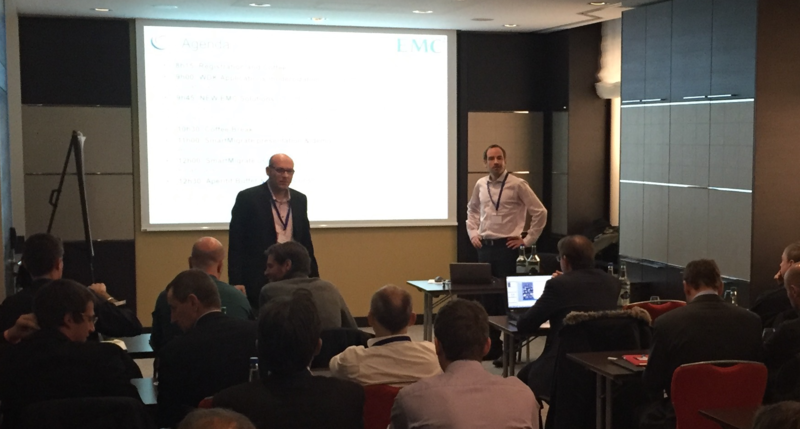 The 26 November 2015, SmartWave and EMC shared their best practices with Swiss Documentum customers and presented how to address Documentum applications modernisation challenges. – Why modernise your WDK application ? – Which Documentum solutions for the modernisation ? Then the focus has been put on each possible solutions : D2, xCP, custom solution (REST / HTML5) and Webtop. I have also shared some lessons learned during the latest modernisation projects performed by SmartWave. Mr Eric Marciano, presales at EMC, has then presented the new EPFM suite based on the AngularJS technology. This modern and intuitive suite will replace in the coming weeks an old solution based on the WDK framework. Eric has then presented the Horizon project, a next generation content platform and marketplace of apps and solutions. This project will redefine Content Management for the Digital Entreprise with a multi-tenant, public cloud native platform. Yann Thomas, ECM Senior Architect at SmartWave, has then presented the EMC Certified solution: SmartMigrate allowing to perform Documentum migration. This solution is fully adapted to the customers moving from WDK / Webtop to D2 and SmartMigrate must be seen as a facilitator to perform affordable and quick migrations. The solution is based on D2 (it can also be used without D2), 100% configurable, and it doesn’t require an installation setup !! Yann has performed a live demonstration of SmartMigrate by configuring a migration sample and performing documents migration during this session. The conference ended with a testimonial provided by Darragh O’Donnell, Document Management Expert in an International Financial Institution, who provided his feedback on the SmartMigrate usage. To cover his use cases, SmartMigrate is accessible and used by non technical administrators to trigger immediate documents reclassifications or to schedule reclassifications off-peak, and all actions performed are captured in the audit trail. SmartWave and EMC tank all participants in this event for fruitful exchanges ! !